We're on our third pizza place in three days. This time? 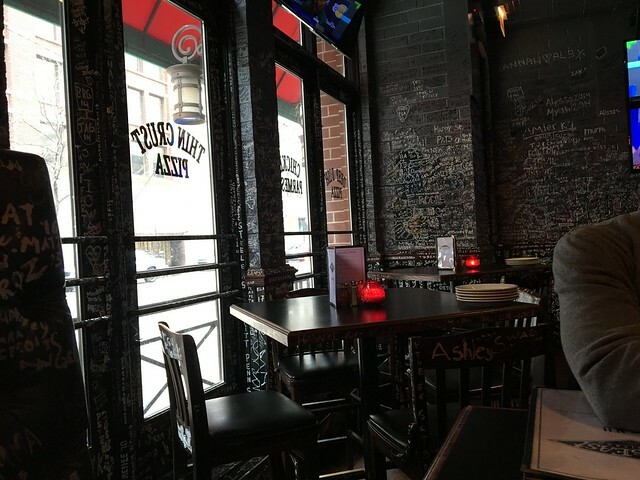 Gino's East. Gino's East was just a block or two from the hotel, so we stopped here for lunch. We actually arrived here slightly before they opened, and we waited outside the doors with a few others for them to let us in (damn tourists). There is writing all. over. the. walls. and. seats. It's everywhere! Which is mostly fine, but I was worried about sitting on it. No worries. After being seated, we ordered the "Gino's Supreme," with pepperoni. It comes with pepperoni or Italian sausage, onions, green peppers and mushrooms. Since Giordano's switched our order, and we ended up with sausage, we still had yet to try one with pepperoni. 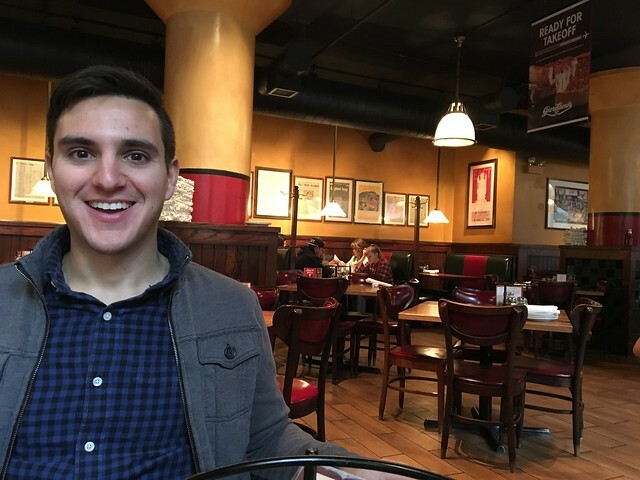 After the waiter read the order back, he said "pepperoni deep dish," which I assumed meant a Gino's Supreme WITH pepperoni. When he came back with our drinks, I clarified, and he basically told me I said it incorrectly (nope) and rushed back to fix it. K.
But, it came out correctly, though I can't say it was my favorite pie. It has a very, very buttery, flaky crust. It almost seemed like I was eating an actual pie crust. I like the crisper crusts better. 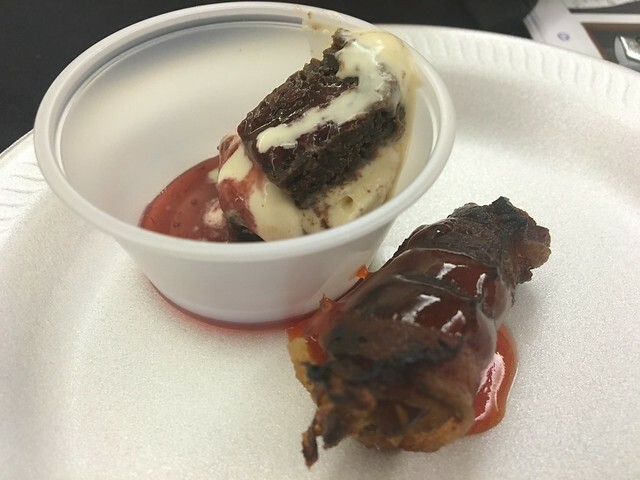 The sauce and toppings were just OK. Little soggy, not a ton of flavor. But, it had the best cheese, by far. Ooey and stringy. Very good. At this point, the appeal of deep dish pizza was wearing on me, and this crust just wasn't doing it for me. Not bad, by any means, but not the one I'd go back to, either. So far in Chicago, I've had the popcorn. I've had the deep dish pizza (2x!). 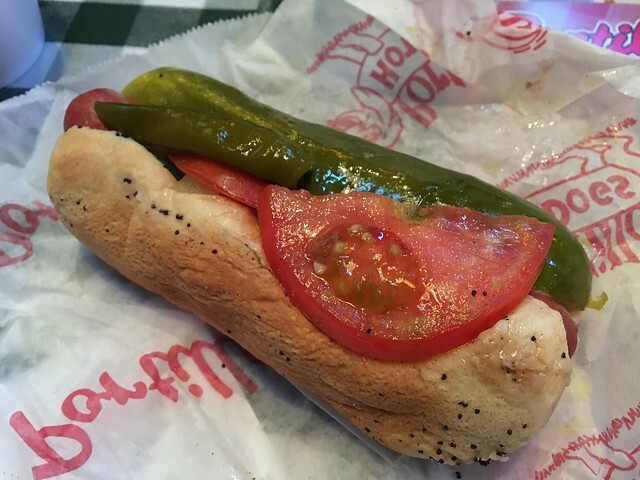 Now it's time for the Chicago-style hot dog. A Chicago-style hot dog is topped with yellow mustard, chopped white onions, bright green sweet pickle relish, a dill pickle spear, tomato slices or wedges, pickled sport peppers and a dash of celery salt on a poppyseed bun. It's said to be "dragged through the garden" with so many toppings. 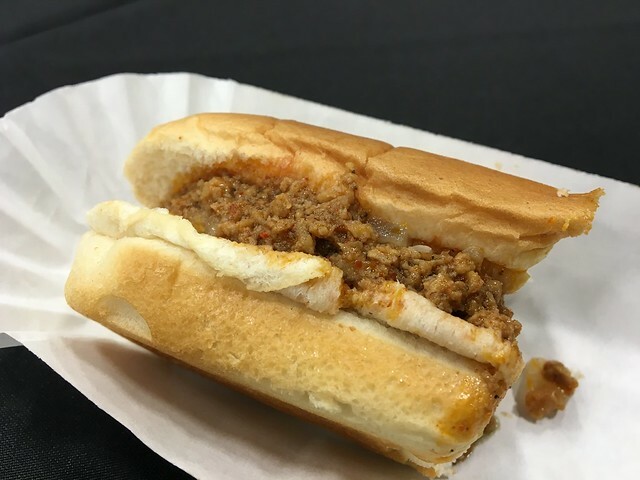 And, it's much different from the West Virginia hot dog (chili, slaw, mustard and onions). 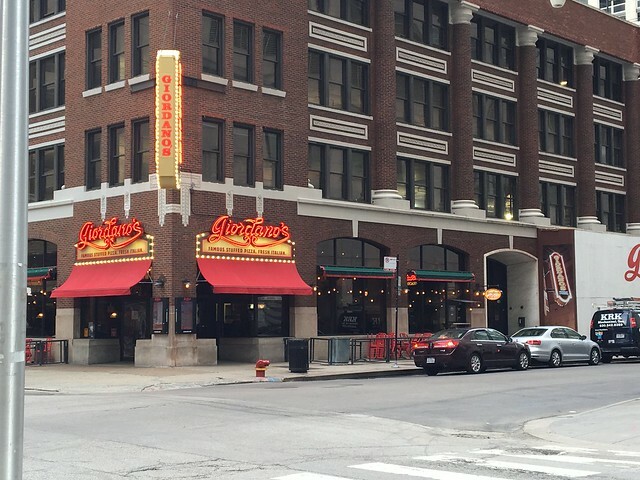 Portillo's is kind of a one-stop-shop for Chicago-style food. 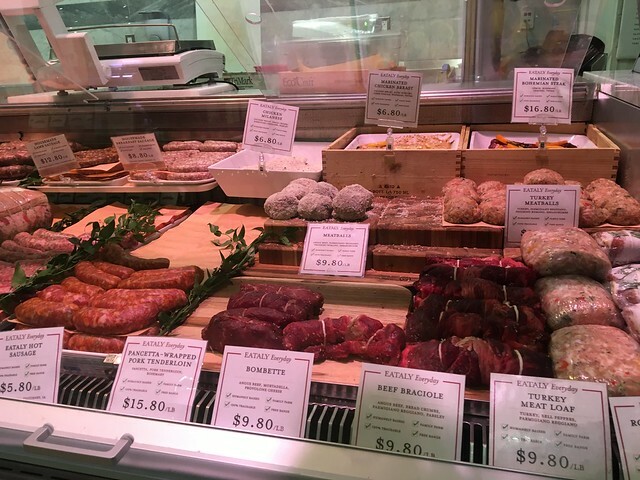 You can get your hot dogs, Italian beef, and a ton more. They are also known for their chocolate cake shakes, which is a milkshake with bits of chocolate cake mixed up. The ordering process is a bit scattered and confusing. 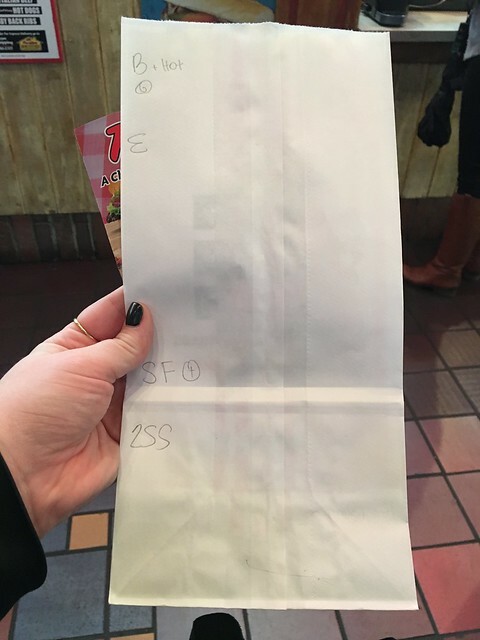 We grabbed menus, walked up to one of the many lines that were forming and initially told a woman with a handful of bags what our order was. She scribbled some shorthand and then we proceeded to the counter. They confirmed our order (which was actually wrong, and they erased and rewrote it on the bag), and we paid. 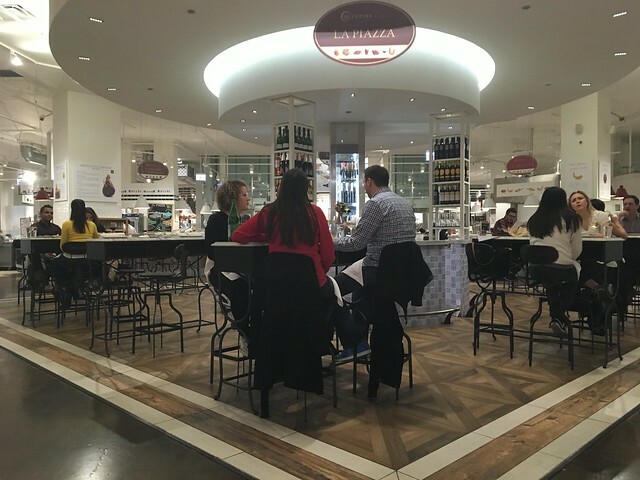 We found our way up to a table and dug in. The cake shake, which I know is a THING, is weird. 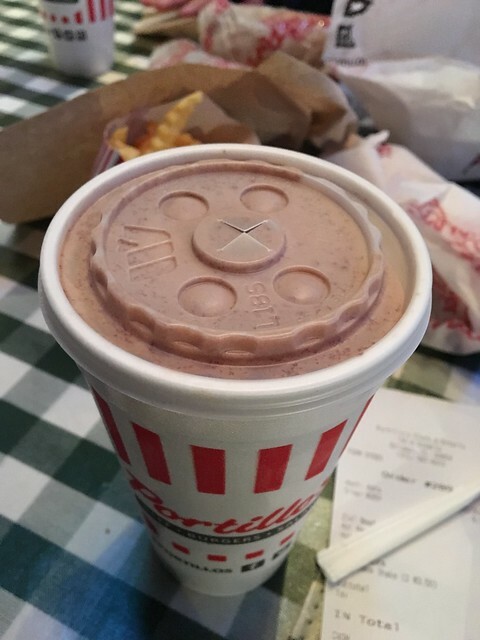 I mean, it's a chocolate shake, so that's not bad. But the small, piecey, almost gritty pieces of cake just disrupted the texture of what I thought a milkshake should be. 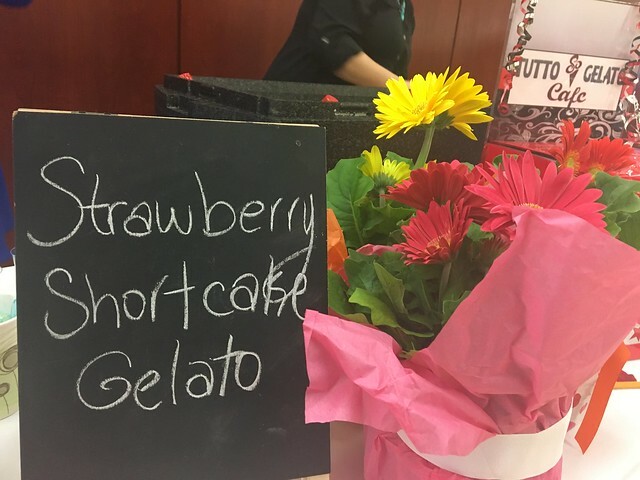 It wasn't bad, of course, but I think I'll take my future milkshakes cake-free. The hot dog was SO good. I didn't think I'd be a big fan of a hot dog with so many veggies on it (because, grumble, gimme my chili and slaw), but it was delicious! The hot dog was snappy and good quality, and I loved the steamed poppyseed bun. 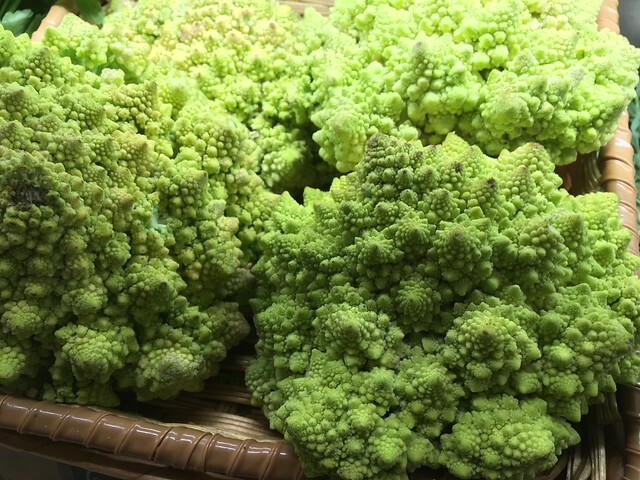 It's a different experience - one that's fresh and not super heavy. Very good. 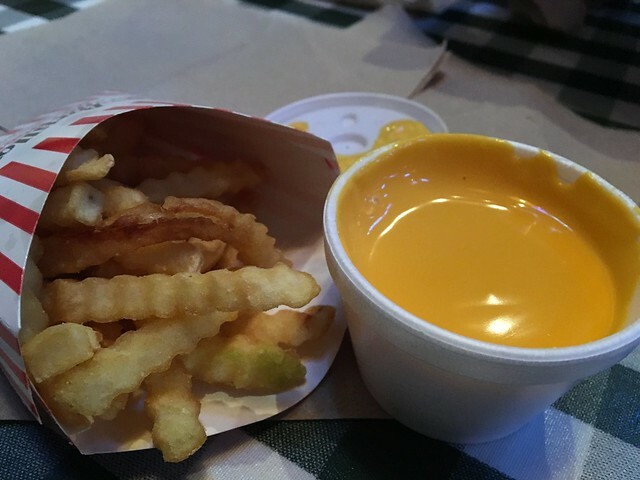 A side of fries and cheese was just the cherry on top. Nothing especially exciting, but when they give you a cup of cheese, how can it go wrong? 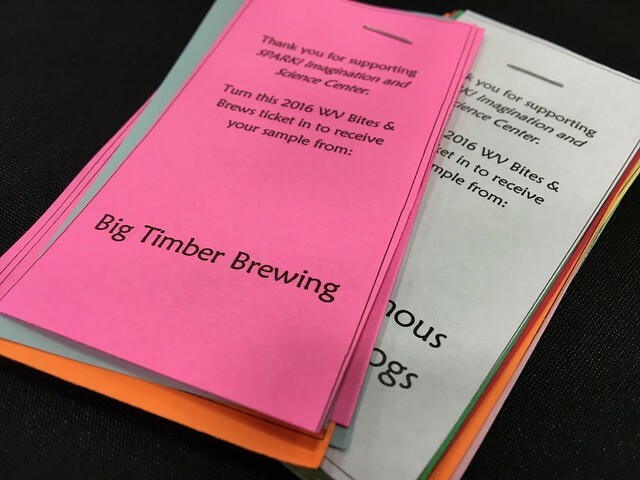 This past weekend saw another great fundraiser: West Virginia Bites & Brews 2016. 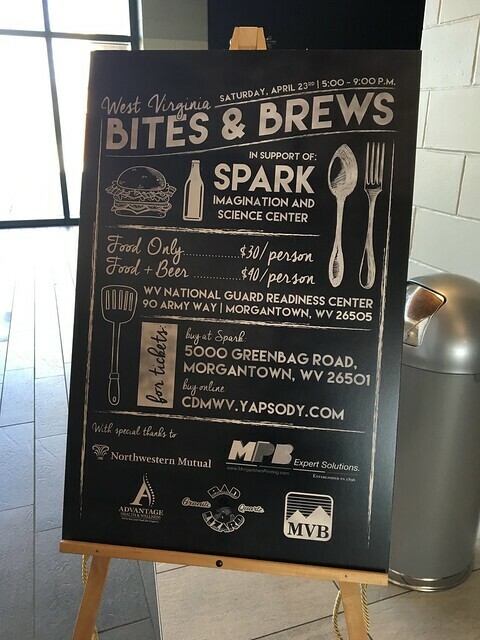 The Children's Discovery Museum of West Virginia, which is now known as SPARK Imagination and Science Center, held the food and beer event on Saturday, April 23 from 5-9 p.m. at the WV National Guard Readiness Center. The mission of the Children’s Discovery Museum of West Virginia is "to inspire children and their grown-ups to explore, discover, and grow together through exceptional learning experiences and interactive play." While I haven't had a chance to visit -- and have no kids to which this caters -- I think it's great to have a place where parents and caregivers can participate in their children's learning experience. The museum operates on admission, memberships, donations, fundraisers, grants and sponsorships. 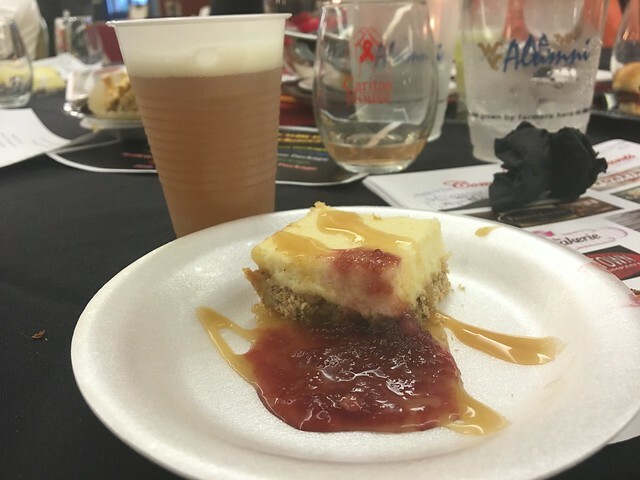 So, the tasty bites and brews event served to raise money for the organization. Tickets for the event were $30 for "bites" only or $40 for "bites" and "brews." If you purchased before April 4, there was a $5 discount. Not too shabby! Plus an 80s/90s cover band "Cover Me Badd." Unfortunately, I'm pretty stupid, and they sold out before I had a chance to purchase one. They sold 235 tickets! So, I got in touch with the organizers to let them know I wanted to write about this first-time event, and they comped me a media pass! Lucky! So, for the food, there were Hash Browns & New Grounds, Jersey's Subs, Russ's Ribs, and Hometown Hot Dogs. 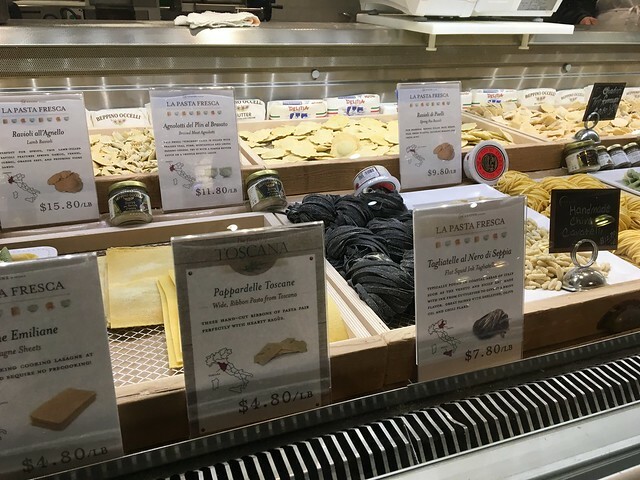 Each had a sample to try, as well as full items to purchase. 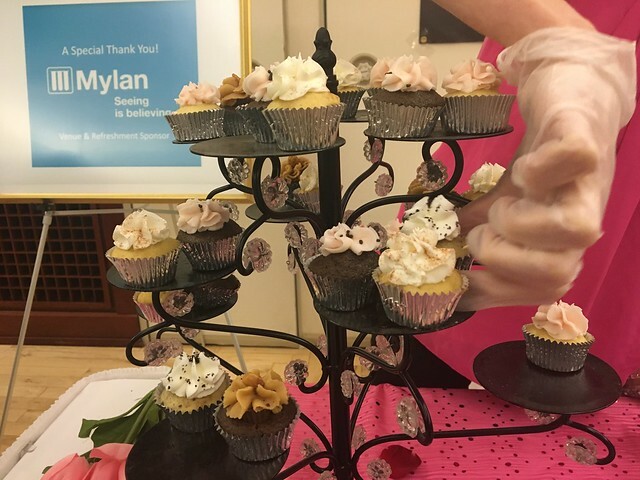 Dessert vendors included Almost Heaven Cupcakes, Apple Annie's and Alayna's Sweet Treats. 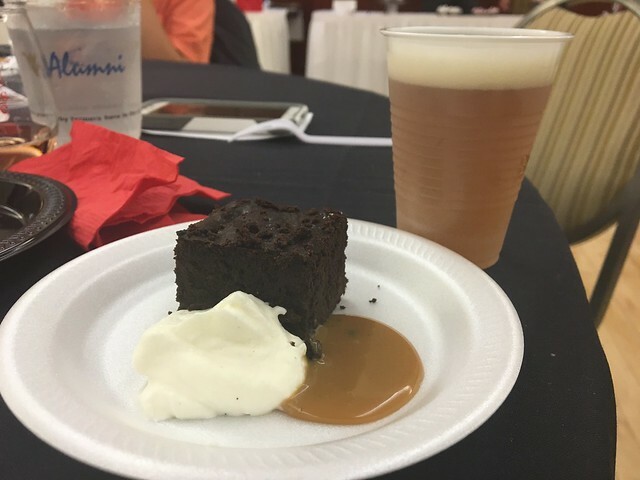 Microbreweries included Chestnut Brew Works, Morgantown Brewing Company, Big Timber Brewing Company, and Northern Eagle Distributing with Charleston Brewing Company and Bridge Brew Works beer - which attendees received a souvenir mug in which to drink all the delicious brews. 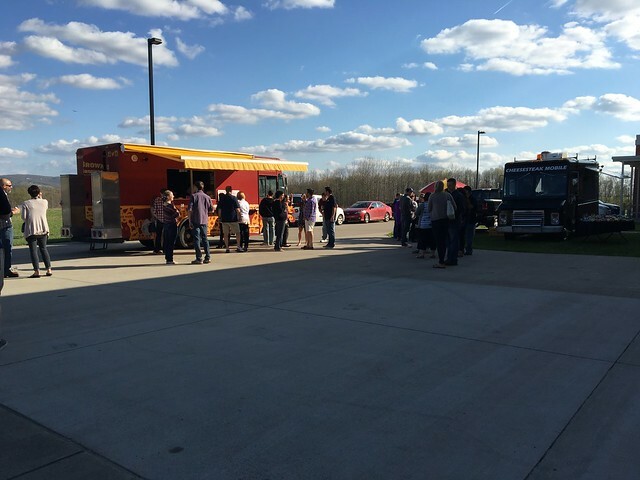 Food trucks were stationed outside, which was cool, and the desserts and brews were inside. Hash Browns & New Grounds gave out samples of their gnocchi macaroni & cheese, which is one of my favorite things in the world. 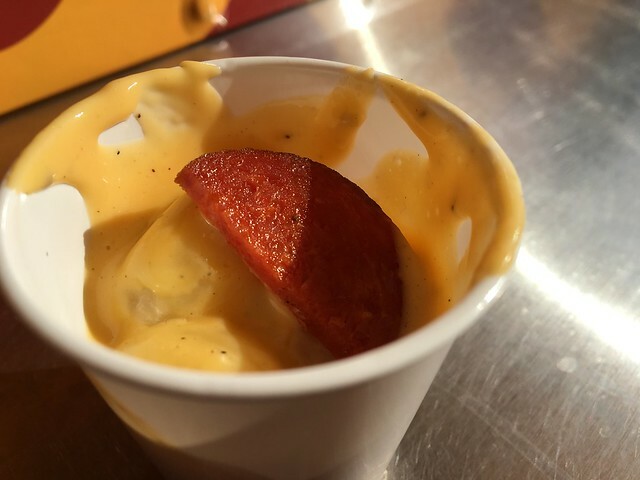 The added spice of the grilled pepperoni pulls it all together. 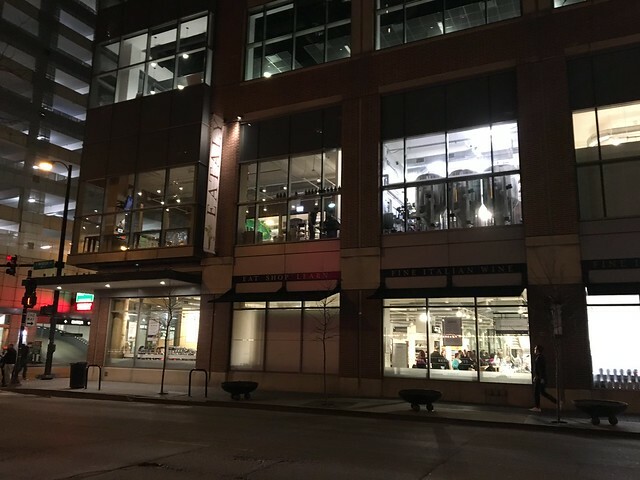 Plus, I got to chat with Cody a little bit about the new restaurant he's opening. So excited to see the cool, crazy, awesome, weird stuff he's doing soon! 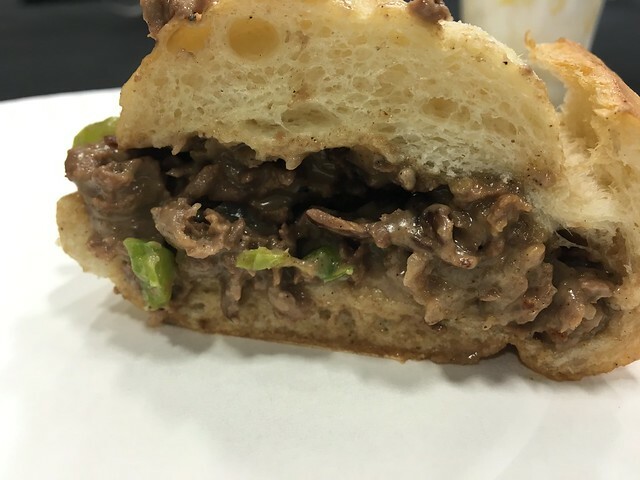 Jersey's Subs gave out samples of their cheesesteak sandwiches - tasty, as always. And, definitely good for the kinda cool, sunny day outside. 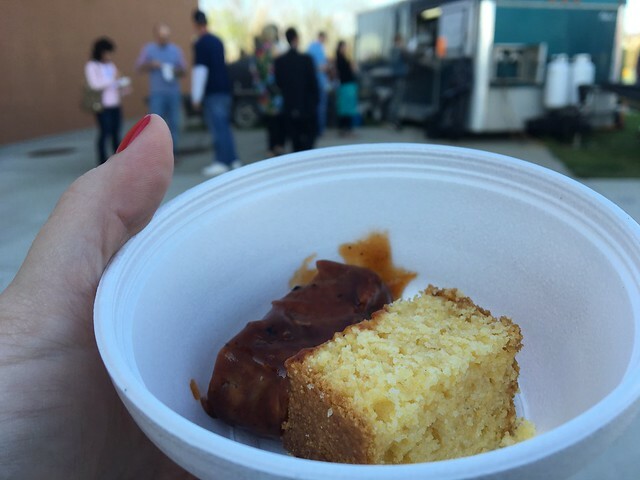 Russ's Ribs handed out samples of a rib and cornbread. At first, I was going to use my fork so I didn't look like a barbarian, but these were so tender, it wasn't even needed. Hometown Hot Dogs dished out half a hotdog with any of the fixins you would like! I went for chili, mustard and onions, which hit the spot. Alayna's Sweet Treats handed out these chocolate cupcakes, which, what I think I heard her say, was that it was her grandma's chocolate recipe from Germany. The band was loud, so it was tough to tell. But, this girl, who is 14 years old, is incredible. 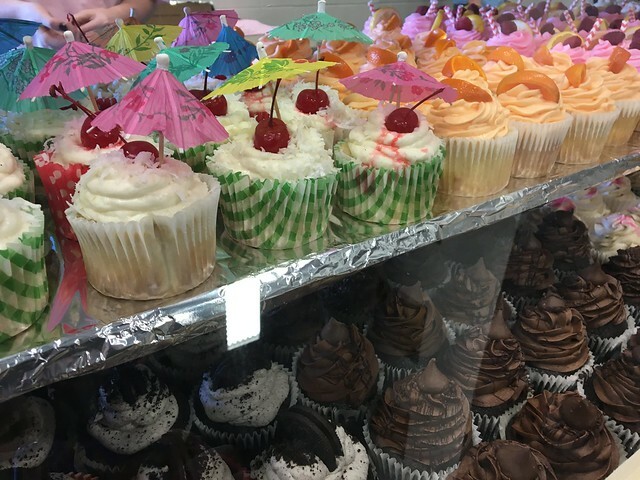 She makes all these delicious cupcakes (look at the photo at the top for full size ones to purchase), and they're beautiful, too! Just super cool. Almost Heaven Cupcakes made strawberry shortcake cupcakes, which were very tasty, as well. And, they just look super cute! Apple Annie's also ended up making cupcakes - oreo ones! 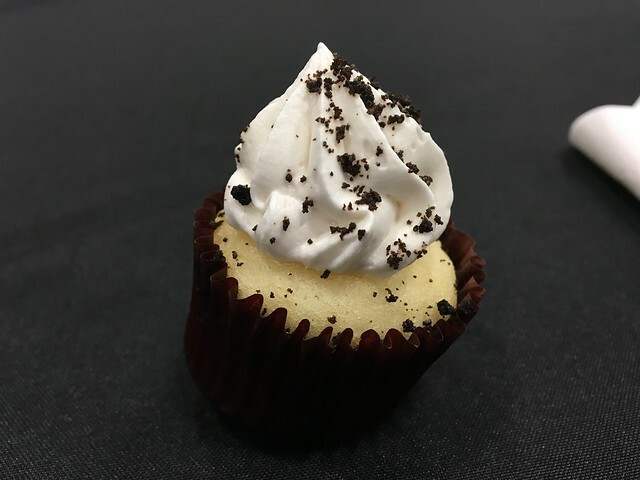 Another mini cupcake that was quite tasty. Lots of good prizes were also up for silent auction and raffles; I ended up snagging a Blenko water pitcher for $40! Great event, with great prizes, and I hope they raised enough money to make this an annual event! If so, I'll see you next year! 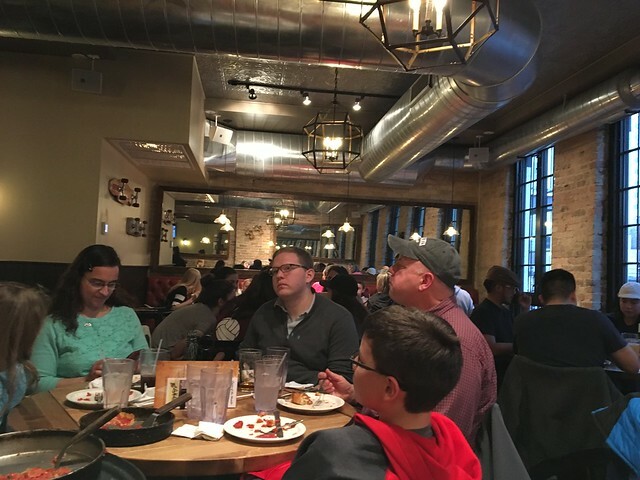 Our second day in Chicago began with deep dish pizza. What better way to start off a conference day than an indulgent hunk of cheesy, saucy pie? 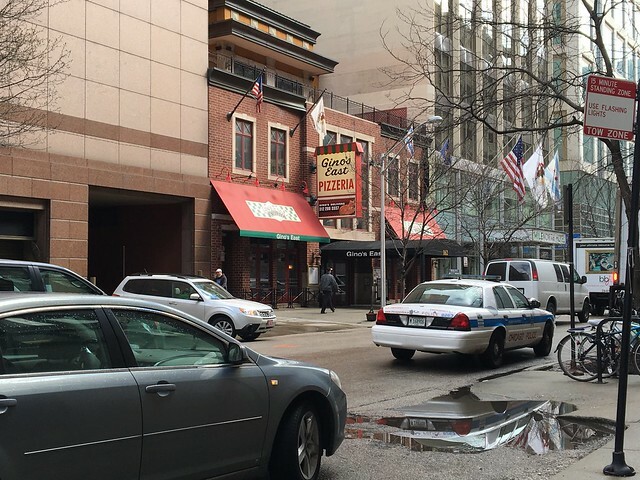 Giordano's was just a block or two from our hotel, and it is one of the big names in "stuffed" deep dish in Chicago. Because we arrived right at 11, we didn't have to wait; we were seated right away. 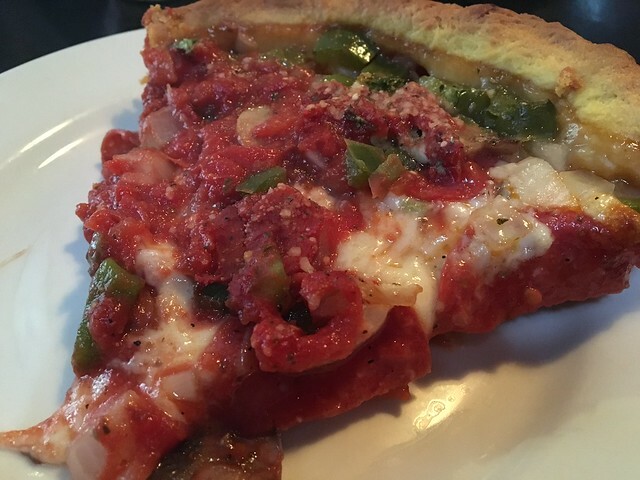 We put in an order for the "Chicago Classic," which has pepperoni, mushrooms, green peppers and onions. When it arrived, it was impressive that it kind of stood up on its own. All the others were served in their pans, which acted as a support. 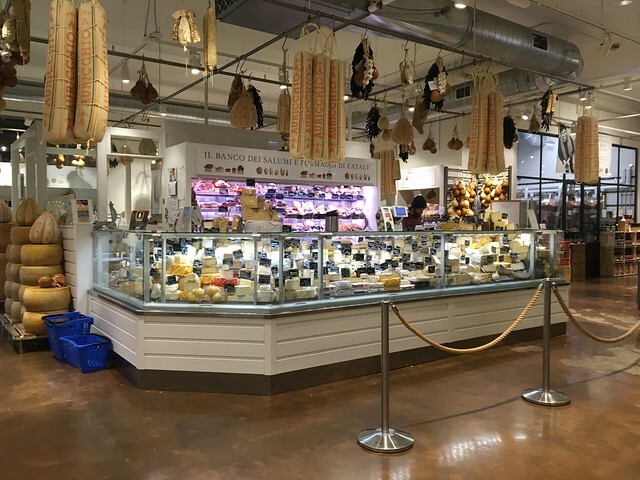 This was a Colosseum full of cheese and sauce. After scarfing down half a piece, I realized that this one had sausage rather than pepperoni (so it was similar to our pizza at Lou Malnati's) and that it was likely swapped with the table next to ours. That's OK. 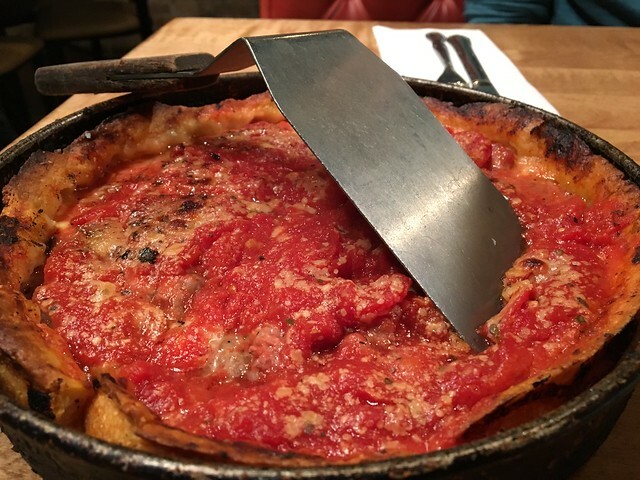 This "stuffed" deep dish pizza indeed had a much softer, flakier crust. 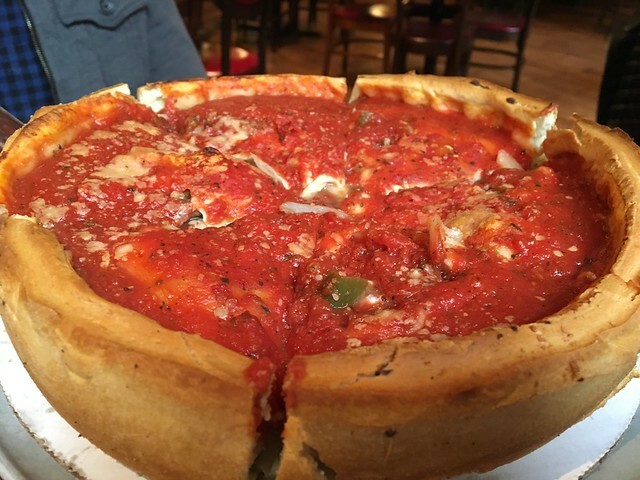 Deep Dish: The original. It features a moderately thick and crumbly crust, which is topped with loads of mozzarella, toppings, a layer of tomato sauce that is usually on the chunkier side. 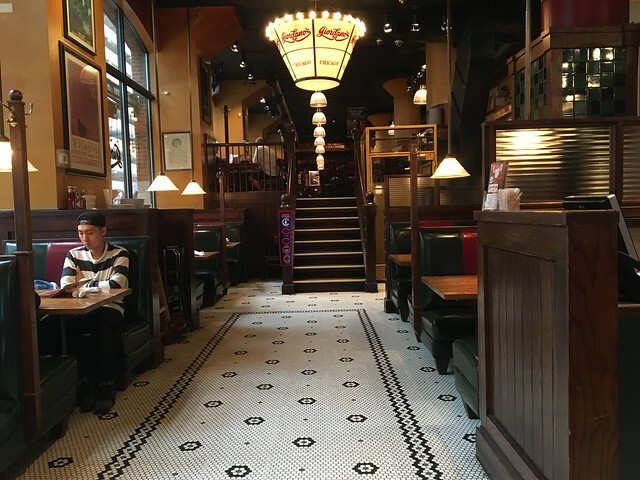 This is the style you'll find at most of the big name Chicago chains, including Lou Malnati's, Uno's, Pizano's, and Gino's East. 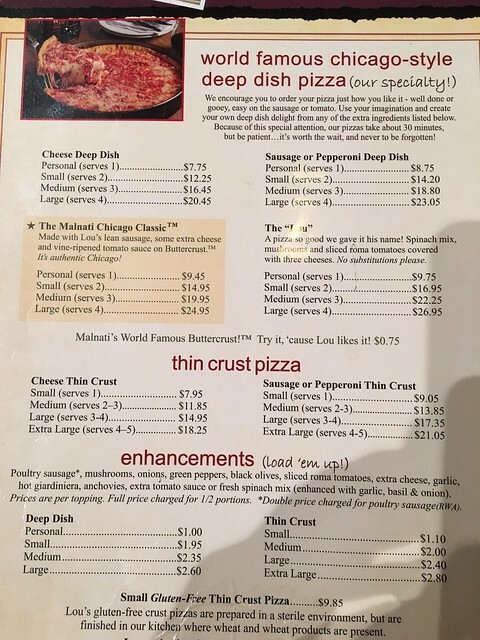 Stuffed Pizza: The first thing you'll notice here is that the ends are actually even taller than deep dish. Instead of crumbly, the crust is flaky, and it's often possible to see distinct laminated layers of dough. But what truly sets stuffed pizza apart is an additional layer of dough above the cheese and below the sauce. Most people don't even know it is there because it's so thin and is the same color as the cheese. 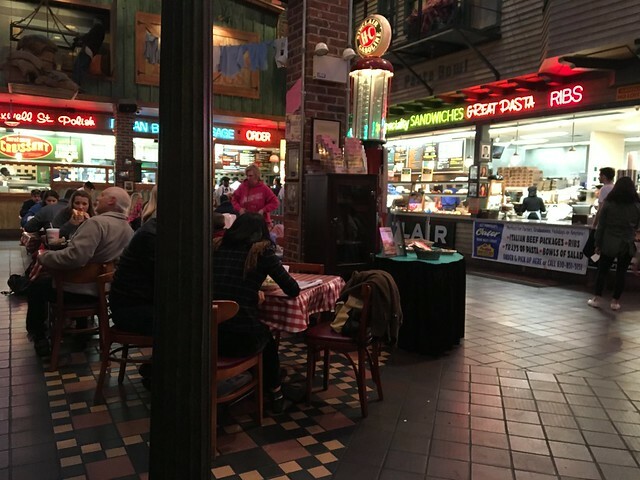 Giordano's is the most famous practitioner of this style, though there are a surprising number of places serving stuffed pizza. Pan Pizza: The distinguishing feature here is a ring of caramelized parmesan cheese, which crisps up in the pizza pan. The crust is also breadier and more in line with pan pizzas you'd find elsewhere in the country. 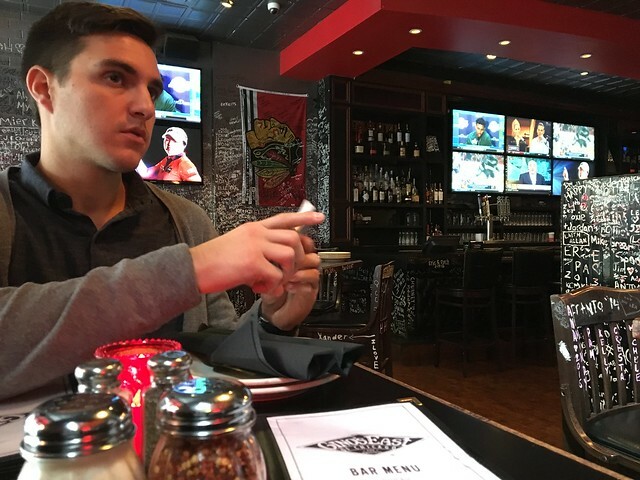 You'll only see pan pizza listed a few places, but they are two big names, Burt's and Pequod's. So, it was quite good. Even if that crust wasn't super crispy, it was still flaky and the toppings were fantastic. The sauce wasn't bad, but I do like a bit more flavor in mine. But, a very good slice, and a filling meal. 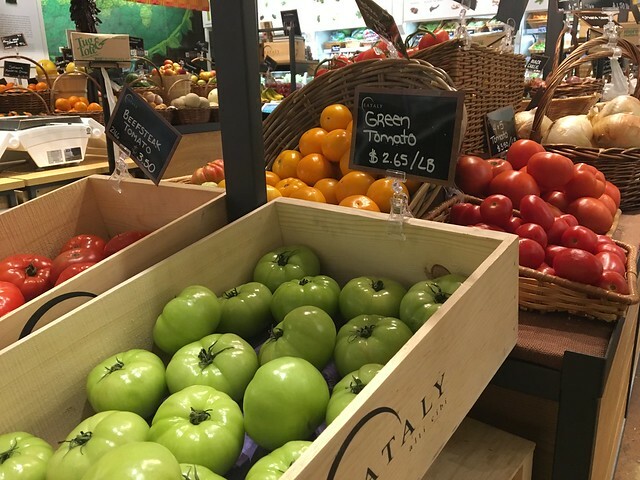 Eataly is an Italian marketplace that comprises retail shops, food counters, a bakery, butcher and cheese shop and more. 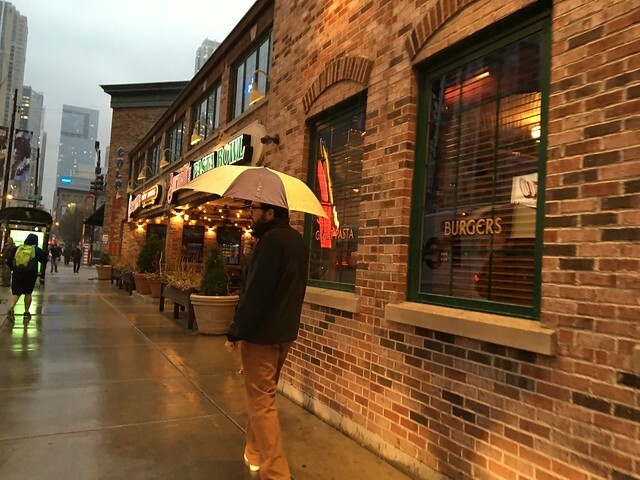 It has locations in New York and Chicago. Walking in, this place is beautiful. It's so modern and refined and gorgeous. I suddenly became aware of my jeans and worn out Toms. I felt like I should slip into something much classier so I could just blend into the beautiful landscape here. 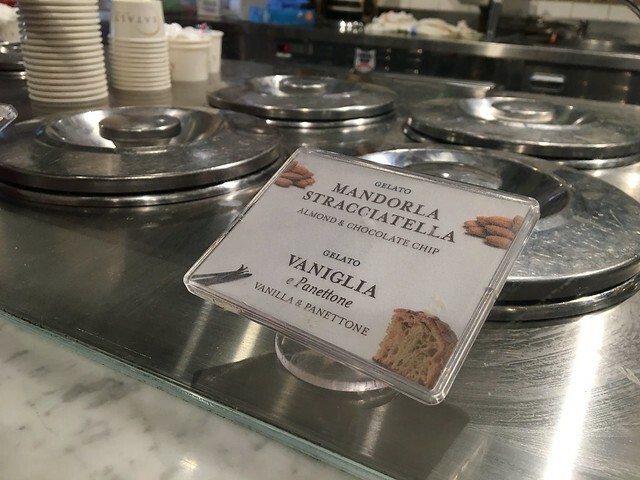 We didn't have a full meal here, but I couldn't walk away without some gelato. 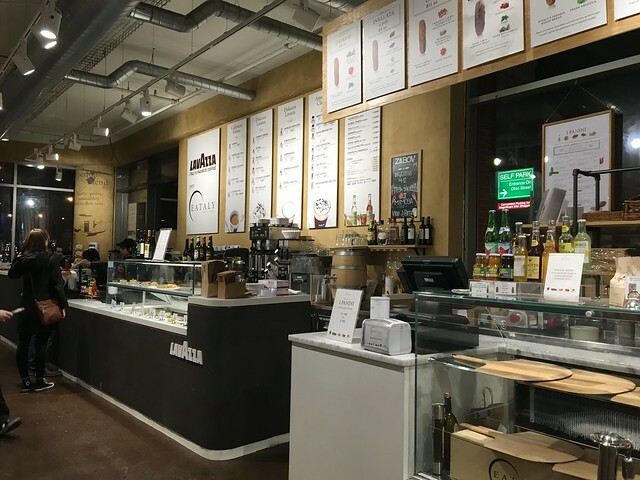 So, we stopped at ... Il Gelato. I got a medium of two scoops with salted caramel and sweet milk. It's so soft and buttery and sweet. The combination of these two flavors was phenomenal (I thank myself for that one). So, in summary, this is one of the best places on the planet. 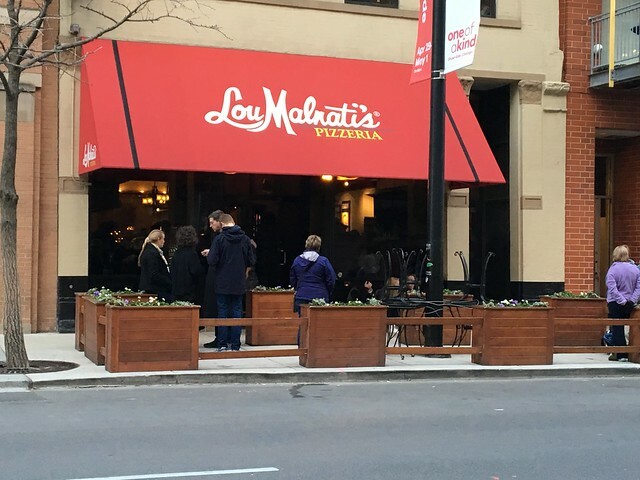 Our first deep dish pizza experience came in the form of Lou Malnati's. There are a handful of major deep dish contenders in Chicago, and we were on a mission to try them all. We arrived at this location around 5 p.m. or so, and there was a bit of a wait. The cool thing was, though, that we put our name on a list, and they estimated it could be up to an hour. And right after we put our name on the list, we could look over the menu and put in our order so they could get them in line. Deep dish pizzas take around 45 minutes to an hour to make, so having this sorted out on the front-end was super convenient. My phone actually buzzed with a notification just 10 or 15 minutes into waiting that our table was ready. Score! We were led up to our table, and they confirmed our order - a small Malnati Chicago Classic with sausage, extra cheese, and tomato sauce. After the arduous wait, our pizza arrived, and the server quickly cut it into four pieces. 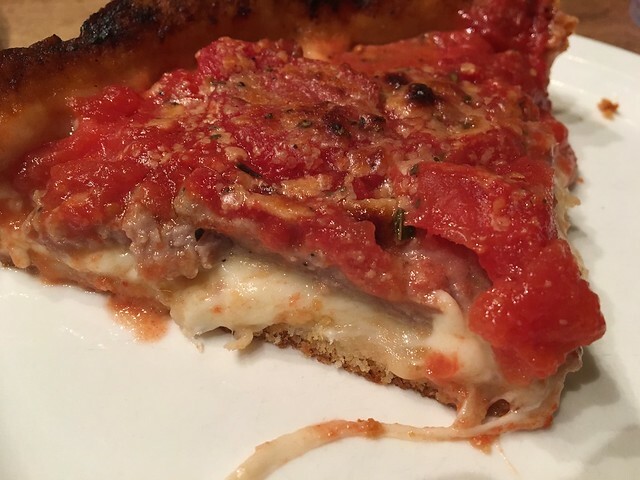 Very crisp crust, a delicious, flavorful sauce and like a layer of sausage. This was so good! It may have been a combination of walking 14 miles that day (literally, 14 miles) or the fact that it was my first deep dish or maybe because I was starving. But this just hit the spot. Yes, I love a New York-style slice, but this is something different. It's like a real meal. It's filling, heavy, and oh so delicious. 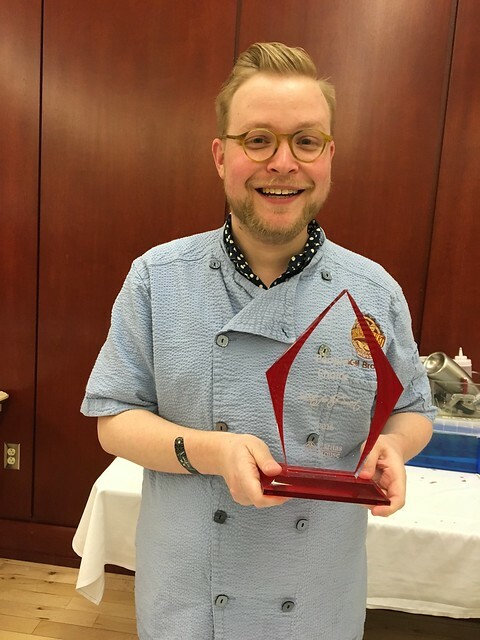 "Sweets for the Sweet" is a local restaurant dessert competition hosted by the Caritas House Inc., which assists people living in 22 counties of northern West Virginia who are living with HIV/AIDS. The Caritas (Latin for charity) House was created in 1994 and is one of three organizations in the state who assist these individuals. 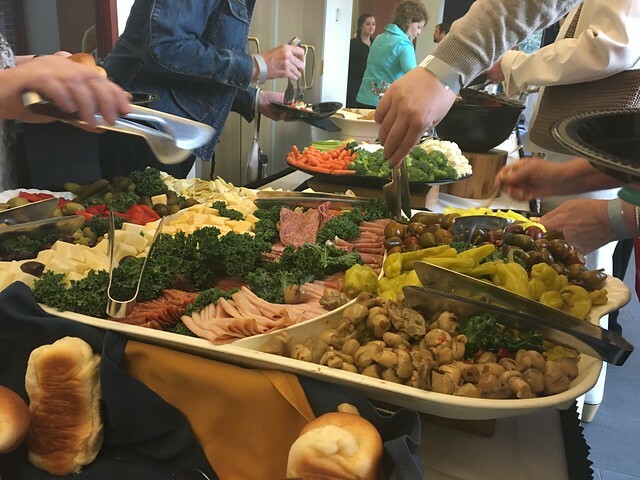 The 20th annual event was held on Saturday at the WVU Alumni Center. It cost $20 and the proceeds benefited the Caritas House. 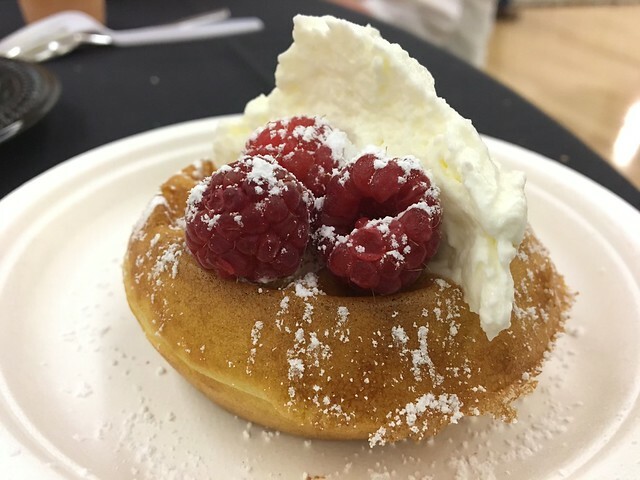 The event featured the dessert tasting competition, raffles, door prizes and auctions. 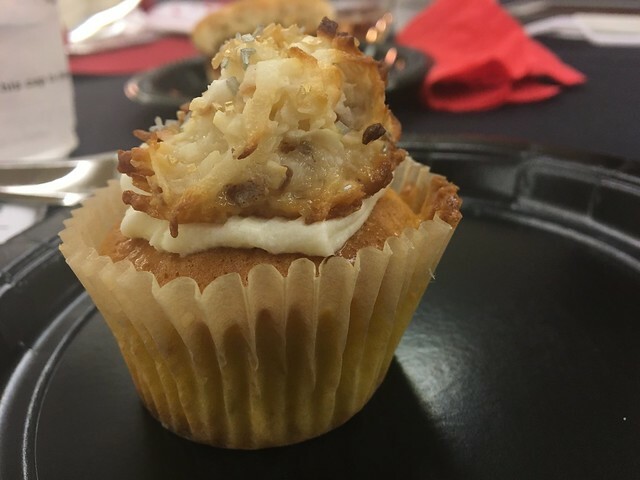 Heather and I found a table right across from Joel, who is my fellow foodie friend within University Relations and happens to bake at Rising Creek Bakery occasionally. Heather's friends April and Emily joined us, and we began making our rounds to the 13 (THIRTEEN!) different restaurant participants. I, of course, opted for the salted caramel tart, because lord knows I love me some caramel. And, this was certainly very caramel-y. 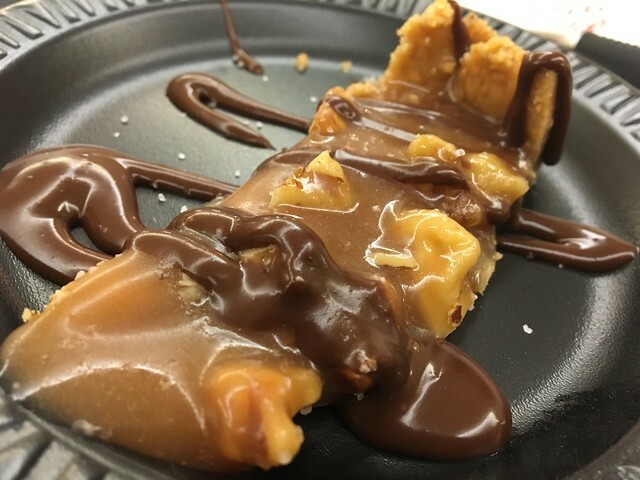 It had sort of melted into this pool of caramel, which was a touch difficult to eat. But, I mean, you can't really go wrong with a pool of caramel. 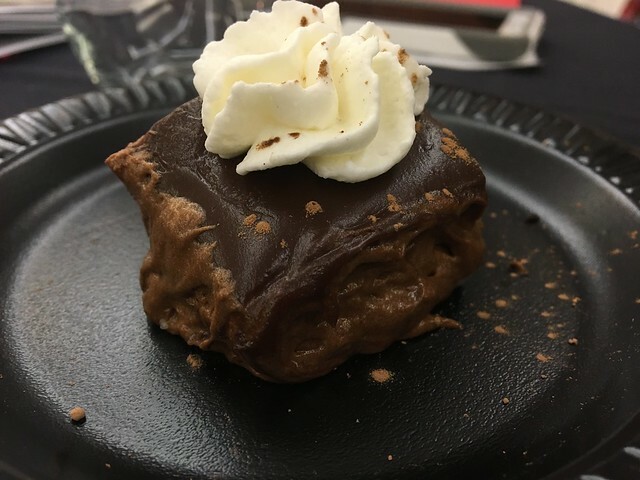 I had a taste of a friend's mousse tart, which wasn't bad. This one won my vote - and not just because it's Joel's restaurant. 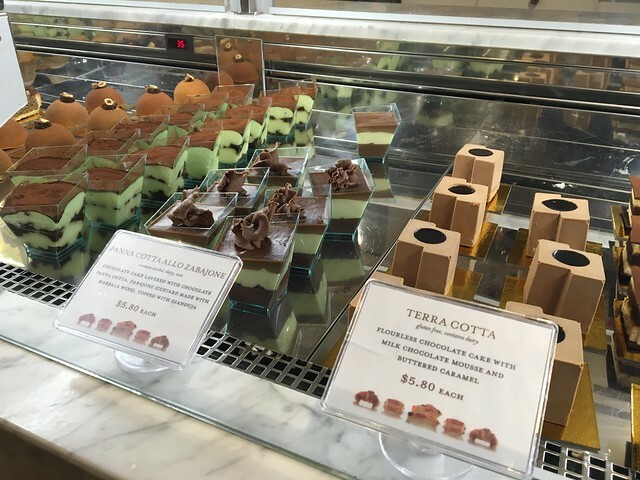 Rather, because the flavors are so well composed and thought out to determine what complements what. The almond crunch was just perfect. I expected something a bit more elaborate from Apple Annie's, because they have these mile-high pieces of pie and cake. 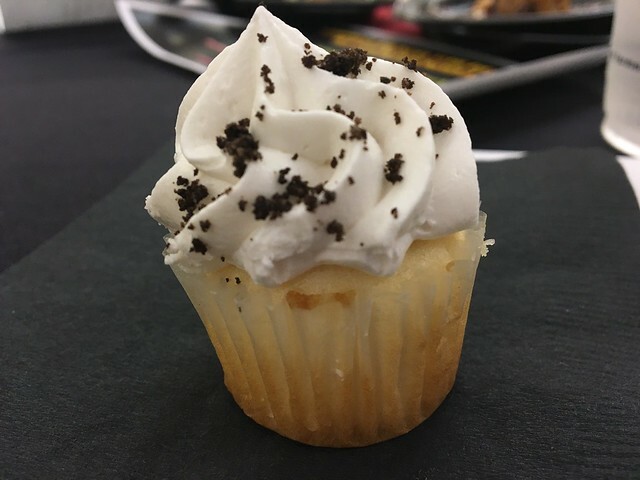 But, a mini cupcake did the trick, too. OK QUICK BREAK. So. many. sweets. We decided to help ourselves to the heavy hors d'oeuvres buffet outside for some salty snacks. OK, back to it. I'm OK with carrot cake; it's typically not my most favorite thing. But this one had some shredded zucchini in it, and it was ever so moist. 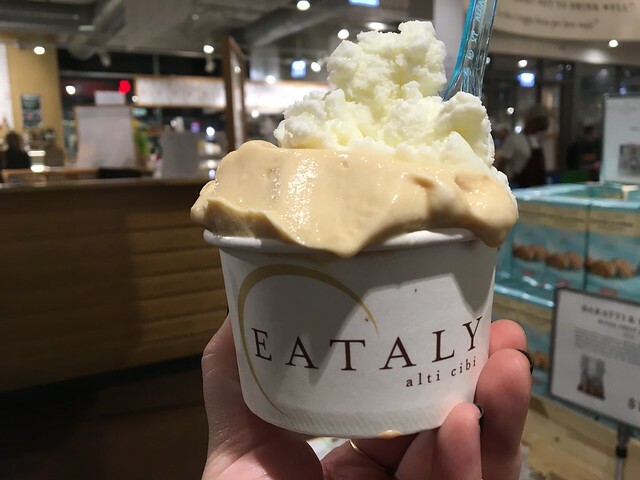 Plus, it was the first time I had ever had grenata, which tasted like summer in a glass. 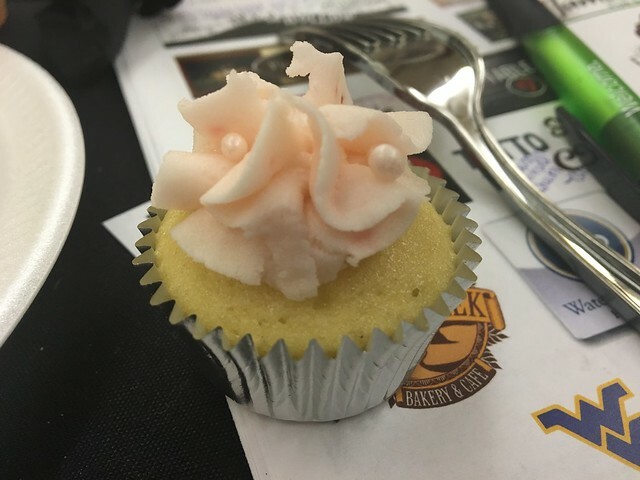 This little cake packed a punch of flavor. The caramelized banana on the bottom gave it some sweetness; and the macaroon on top was good enough all on its own. 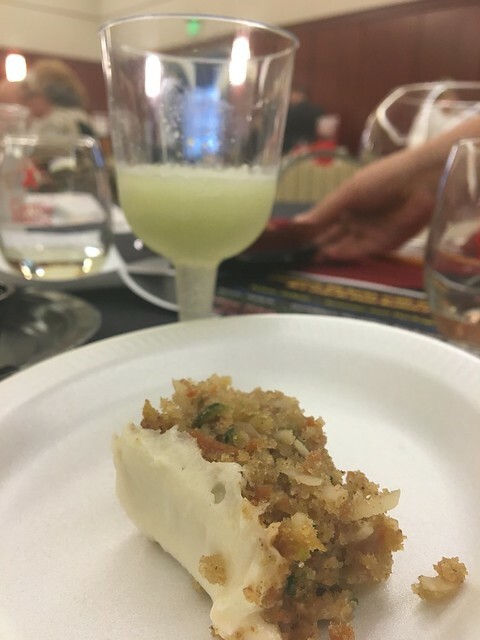 I went with the cheesecake, which had a good crust, and I was a fan of the jelly. The brownie was a bit dense for my taste. But, again, gotta give it to Brew Pub for always doing something creative -- and with beer, too. The Devils on Horseback are always always top notch for me. I love the sweet and salty. But, the peanut butter ice cream sandwich was very smart and very good. 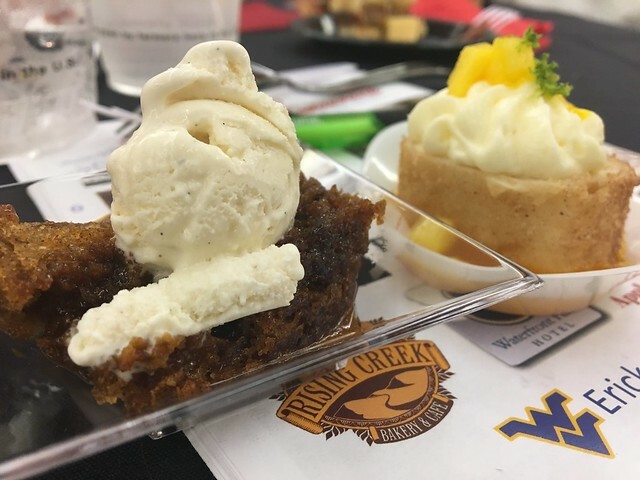 Table 9 was one of my favorites, and if it wasn't for Rising Creek, there's no doubt they would've been my #1. 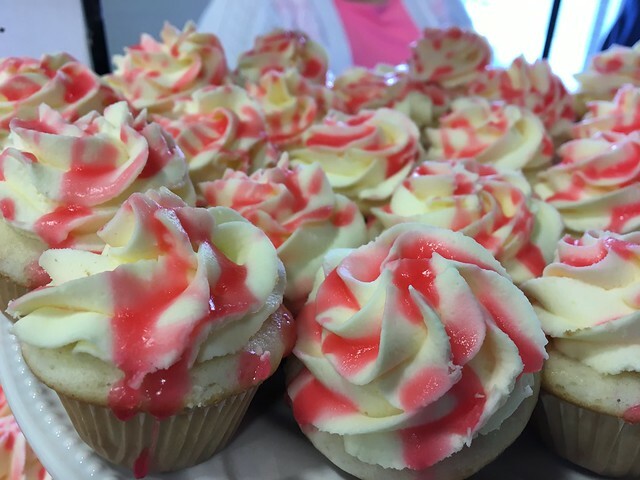 I went with a mini strawberry cupcake; tasty, as usual. While the cheesecake was kinda tough to eat, I died over the warm toffee cake with ice cream. Definitely in my top favorites of the night. 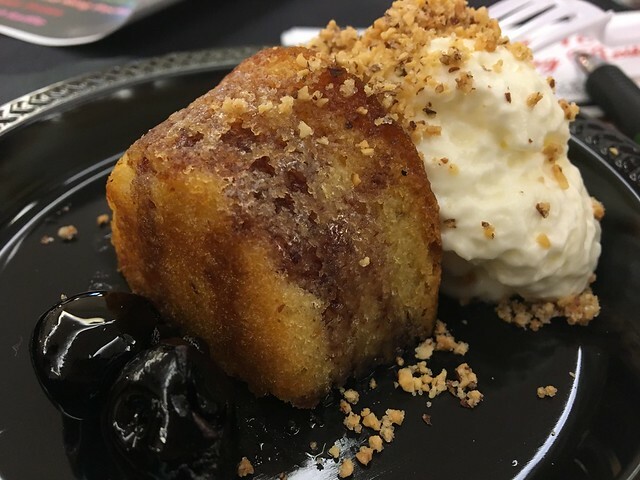 Warm, gooey and rich. So delicious. 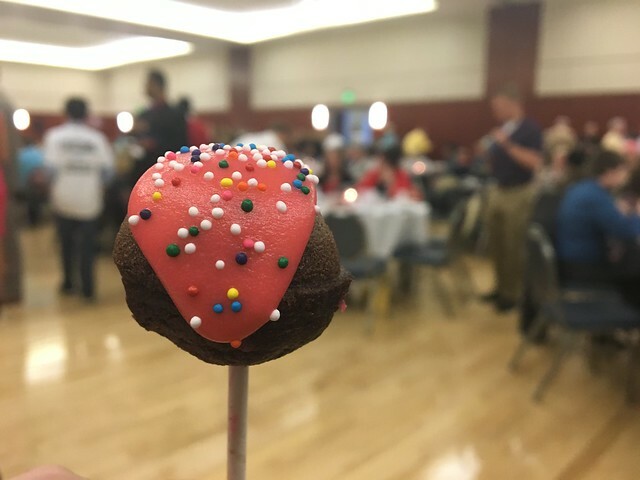 The chocolate cake pop was fairly run of the mill, but it sure looked cute. First of all, these waffles were damn good. Perfectly crisp and golden brown, giving way to pillowy fluffy inside. An assortment of waffles, plus fresh toppings and local WV maple syrup made for a home run. 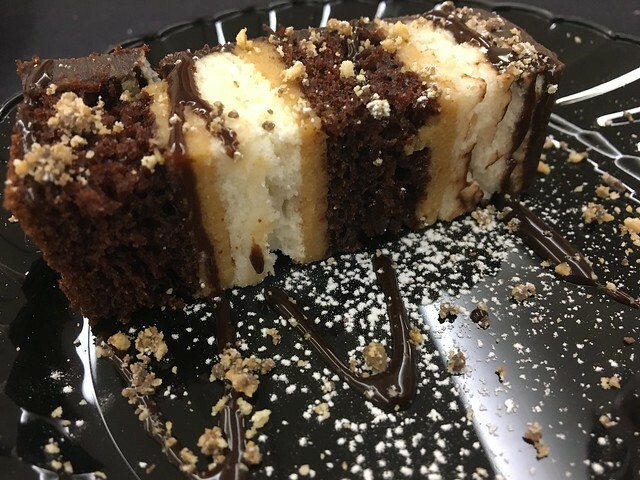 This is seven layers of devils food and angel food cake between layers of peanut butter mousse frosting. Tasty. 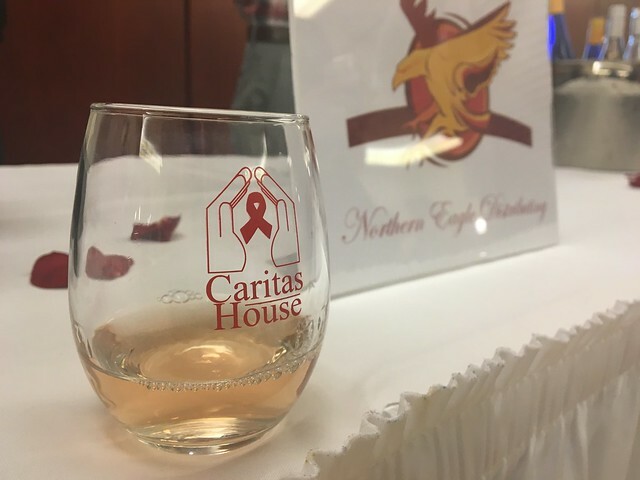 Also, shoutout to Northern Eagle Distributing for serving up a delicious rose. This is always a super fun event that benefits a great cause. 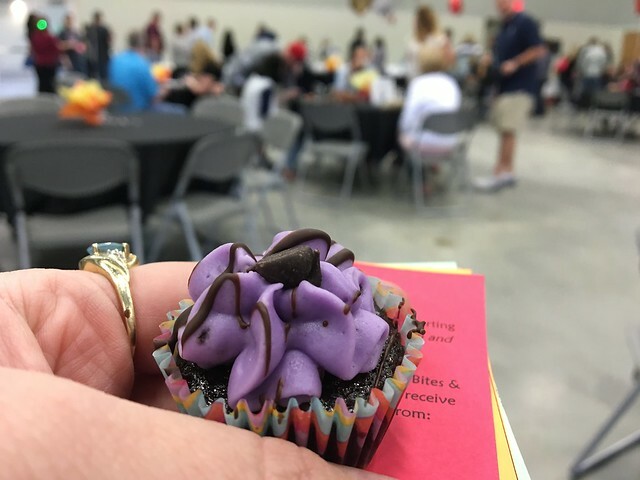 If you didn't make it to this year's event, be sure to catch the next one.